As odd as it might seem, the topic of whether or not there is gold in Fort Knox is something that I have only recently become aware of as a student of “conspiracy”. I know there are many fellow travelers who are aware of this topic and who have been studying it for a longer time, but I decided to blog on this as it caught my attention in a big way…especially in consideration of our nations current financial crisis. 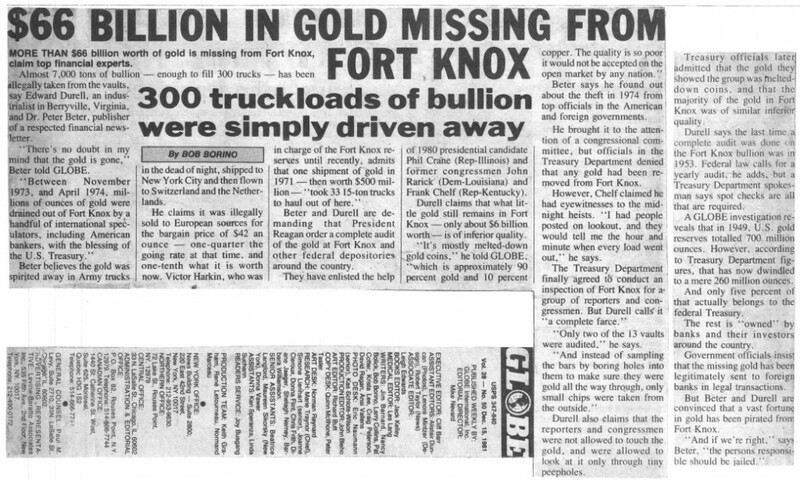 In the 1981 article from Boston Globe reporter – Bob Borino – it is written that in 1974 a significant amount of the gold reserves in Fort Knox was spirited away in the dead of night to undisclosed locations in New York and un-named foreign countries. The reasons I found this extremely disturbing are that, in the first place, our nations financial security is more or less based on good faith in our government’s honest dealings since we abandoned the Gold Standard in 1971. At that time the United States government basically made it illegal for citizens to hold minted gold currency as legal tender, in favor of the fiat paper currency still in use today. If the gold which is supposed to be in place as a hard asset backing up our paper currency is truly no longer in Fort Knox, and in an even worse set of circumstances…no longer even in the possession of the United States…then we have no way to ever possibly repay any portion of our national debt, no way to maintain the perceived value of the dollar internationally, no way to avoid hyper-inflation, and eventually no way to maintain our trade status with the countries which currently supply our nation with food and other essentials…countries upon whom we are almost completely dependent. Many conspiracy researchers are aware of the pending Globalist action of the intentional rapid devaluation of the American Dollar and the intentional collapse of the American economy. Many of us are also aware of the pending resignation of Federal Reserve Chairman – Ben Bernanke at the end of July or first part of August 2013. We see the beginnings of a wholesale “dump” of the American dollar internationally and the end of the Dollar as the primary form of trade currency. This turn of events is only going to get worse in the coming months. Can you imagine a scenario in which our very government, in collusion with the Globalist agenda, kick-starts the final assault on the Dollar after Bernanke leaves the Federal Reserve, there is an engineered global panic reaction, a number of foreign countries to whom we owe debt demanding re-payment immediately only to find out that The United States has not had the gold to back up its own debt since the early 1970’s. I will leave it to your own creative imagination to come up with what may happen from that point forward. The truly, criminally ironic thing is that after the midnight theft of the gold reserves in 1974, it coincided with the completion of the World Trade Center Towers in New York. “What does this mean?” is what you’re probably asking. Well, on September 11, 2001, after the destruction of the World Trade Center Towers, it was revealed by former Port Authority officers that the second largest gold supply in the United States was located in the sub-basement of WTC Tower #1 (some estimates say as much as $500 Billion worth). There were reports from NYPD and Port Authority sources that describe an event prior to WTC Tower #1 collapse, a large number of dump trucks with an unknown payload was seen leaving the underground tunnel network which is beneath the Manhattan Business District. When the rubble from 9/11 was removed, nothing was mentioned in any property insurance claims, or from any news agency of the missing gold supply. None of it was recovered from the rubble of the towers. It was not melted by the jet fuel (kerosene). It was not vaporized by the collapse of the towers, it was not seen or carried away by the people of New York. I happen to believe that the gold which was smuggled out of Fort Knox in 1974 is the very same gold that went missing from WTC Tower #1 on September 11, 2001. But please do not take my word for this…research the topic and decide for yourself. Or, if the scenario I’ve presented makes absolutely NO sense, and you feel more comfortable sliding back into your security blanket of denial…then by all means, do so. But, if this blog makes you think, and the conclusion you come to is similar to mine, then be angry, let your voice be heard. Contact you elected representatives and demand answers, demand accountability. Because in the early 1970’s a group of individuals within our own government and in big business STOLE your future, your CHILDRENS future…and it’s time they answer for it!!! SD has discovered the manuscript of a 1981 article by The Globe which reported that 7,000 tons of gold bullion were removed from Fort Knox from $1973-74, and the only bullion that remained was from melted down gold coins & was of such poor quality (at least 10% copper) that it would not be accepted on the open market by any nation. Fascinating article, which I feel is valid. I have for a long time thought that the gold was long gone! Thanks for the reference to this blog. I am far from being an authority on the matter, I only tried to connect the “dots” or the circumstances to paint a possible picture. I hope everyone who reads this takes the situation seriously and researches more on their own. It’s time we take OUR nation back.